I’ve been looking forward to Watchmen for months. Ever since seeing that first trailer, I’ve been psyched to watch this movie. I’ve never read the graphic novel, but every comic book geek I know has been declaring their love for Watchmen for ages. Here’s a bit of backstory first. I hadn’t read the graphic novel before watching the movie. I had bought it quite some time ago, but just never got around to picking it up and actually reading it. Eventually I just decided to go see the movie first and read it later. Then I got the invite to the bloggers screening, while I already had booked tickets to the IMAX. So I thought I’d go see the movie at the bloggers screening first, then read the novel and then see it again at the IMAX. So this review is mainly written from the perspective of someone who hasn’t read the comic before the movie, but (because I’ve read a bit of it by now), can kind of compare how the two relate. I won’t be giving any spoilers at all about the plot, just general remarks of what I found of Watchmen. Watchmen is set in 1985, in an alternative reality, where super heroes are real, America has won the Vietnam war, and Nixon has been elected to a third term. When a retired superhero is murdered, the members of his former team try to uncover why someone is targeting costumed heroes. So did I get this with Watchmen? During the movie itself not a single time. Heck, even during the discussion with the other bloggers afterwards that feeling was still missing. No, it came way later on the tube ride back, that I really started thinking about the movie and since then my mind keeps going back to it. I still can’t put my finger on what it is exactly, but since starting with the graphic novel I’m realizing it’s more about the concepts within the movie (and the graphic novel) than the actual movie experience. It’s not that it’s a bad movie (although some of the bloggers at the screening may disagree), not at all, but here it’s not about the visual effects, the acting, or even how the story unfolds on screen or how much you care about the characters. It’s about the questions and issues the story raises and how you start analyzing the movie and its characters. That being said though, the visual effects, the acting and everything all do work in this movie. Yes, there is a lot of CGI, but from the start you’re transported to this other world and, just like with 300, there’s a surreal fantastical feel to this world you’re seeing. The actors are all perfectly cast, even more so after reading the start of the graphic novel; some of them are are eerily similar to their paper counterparts. 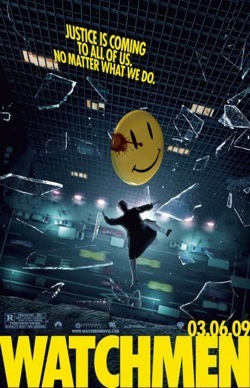 From what I’ve seen of the graphic novel, the scenes too are uncannily lifted from the pages, with details such as background posters and graffiti being copied to a T.
I think Watchmen is truly a movie you’ll have to see twice. Or you have to have read the comic book beforehand. For someone watching it for the first time, you do have a feeling you’re missing information and that you have to piece stuff together. It’s just simple things like realizing what the name is of each character, and what everyones relationship is. I think (although I haven’t gone a second time yet), a second viewing would help a lot. I can’t wait to see it again at the IMAX tomorrow. This is a movie you have to see in the cinema. With all the different opinions about it already floating around, you’ve got to see to create your own. You might end up hating this movie, you might end up loving it. But however you end up feeling about it, Watchmen will make you think.